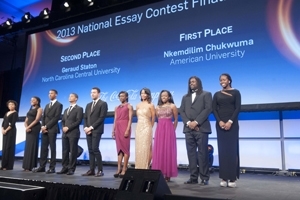 Frederick Douglass Distinguished Scholar Nkemdilim Chukwuma (farthest to the right) was honored at a gala for winning first prize in the 2013 Executive Leadership Foundation national essay competition. Nkemdilim Chukwuma recently won first prize in the 2013 Executive Leadership Foundation national essay competition. On October 24, she was honored for her achievement—which includes $7,000 in scholarship money and an internship in the corporate sector—at the Executive Leadership Council gala in National Harbor, Md. In her award-winning essay, Chukwuma attempted to shatter the myth that the Millennial Generation is entitled and lazy. “I saw all these misconceptions of what a Millennial is. I was like, ‘how could this be?’ And there’s no better way to get the message out there than writing,” said Chukwuma, a sophomore business administration major. It’s fitting that Chukwuma wrote about the promise of the Millennials. As part of American University’s Frederick Douglass Distinguished Scholars (FDDS) Program, she represents the best and brightest of her generation. Frederick Douglass Distinguished Scholars are high achievers committed to social justice and the advancement of under-resourced and underserved communities. “The Frederick Douglass Distinguished Scholars program is developing and coaching the world’s next leading humanitarians,” said Larry Thomas, the program’s inaugural director. The students receive scholarships that cover full tuition, room, board, fees, and books for all four years, as long as they maintain a 3.2 grade point average. Scholars who earn at least a 3.67 GPA can get supplemental funding to study internationally. These incentives help the FDDS program recruit top-tier talent. The FDDS program was the vision of American University provost Scott Bass. An earlier incarnation of the program, created in 1968 after the Washington, D.C. riots over the Martin Luther King assassination, gives partial scholarships to Frederick Douglass scholars. Bass wanted to build on that success and created the new distinguished scholars program with full tuition coverage. Launched in 2009, he brought in director Thomas, who managed Syracuse University’s Collegiate Science and Technology Entry Program and had a record of mentoring students. As an abolitionist and advocate for women’s suffrage, Frederick Douglass was a natural inspiration for this group. The inaugural FDDS class will graduate this spring, and there’s already evidence of considerable success. Falon Dominguez, a senior, interned at Google over the summer, and she’s already landed a job to work for the search engine giant after graduation. She’ll be part of the global customer services team at Google’s headquarters in Mountain View, Calif.
Dominguez grew up in Jacksonville, Fla. The Frederick Douglass scholarship money enabled her to attend AU, and she’s made the most of her opportunity. “We got a lot of personal mentorship in actually working with [Thomas]. We talked about what I was interested in, and how we were going to get me there and have these amazing experiences,” she recalled. In fact, it was during an FDDS-related graduate school tour in California when she first toured the Google complex, eventually leading to her internship. A double major in international studies and economics, Dominguez also does work for the empowerment group Voto Latino. Rodrigo Futema was born in Brazil and raised in Columbia, Md. He became a distinguished scholar and also worked for FDDS, serving as a student services and external relations specialist. Unsure about his career path, Futema traveled to Rwanda after his freshman year. “What I realized there was that I should stop running away from my obsession with soccer, and I should actually think about pursuing it as a career,” said Futema, a junior. Now he hopes to work in the business world of soccer, using it as a tool for economic development and social good. Similarly, Chukwuma sees the value of corporate responsibility and has volunteered for youth empowerment causes. And she drove this point home in her essay. In addition to individual achievement, the distinguished scholars have learned to work as a team. Students founded a group called FotoSynthesis, an education project to connect students through social media and photography. For an Adobe Youth Voices-UNICEF challenge, the group recently created an online video refuting racial and cultural stereotypes and won $30,000. In the future, Thomas is hoping to launch a visiting scholars initiative and a summer bridge program requiring international study. And he stresses the importance of networking and experience.